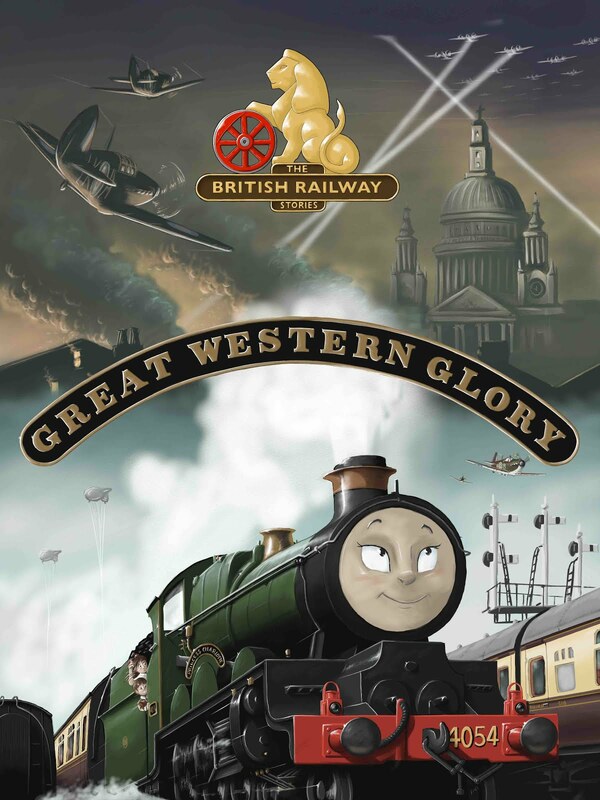 THE BRITISH RAILWAY STORIES LTD: "Defrocking a streak! 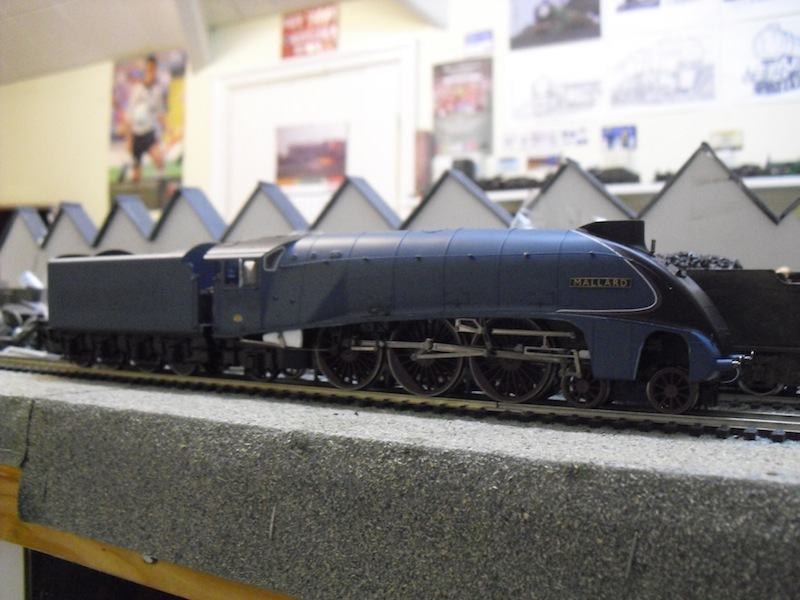 60022 Mallard"
So with that in mind, we will have a brief interlude from the Thompson Pacific builds for the moment. 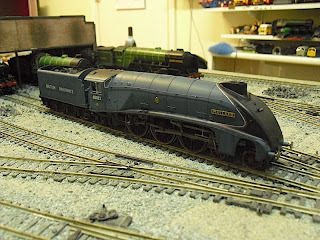 I had managed to get a right bargain on eBay last week, a £35 "spares or repairs" model of LNER favourite, Mallard. A spare set of valve gear and a new motor were fitted last week after some investigation into the causes of its non running. It's now running as smooth as a brand new model. However, I am modelling the years 1949-52 for the next incarnation of Copley Hill, and what I wanted was a model of Mallard in her British Railways form. Cue the scalpel, files, and the fitting of a spare smokebox numberplate from a BR Green Railroad Mallard bodyshell (used for the A2/2 and bought in a job lot of spares on eBay), and we get this: a completely "defrocked" and plainly British Railways form, A4! 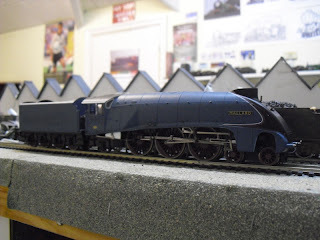 I had made myself a template for the valances using another spare A4 bodyshell (from the same job lot of spares earlier). 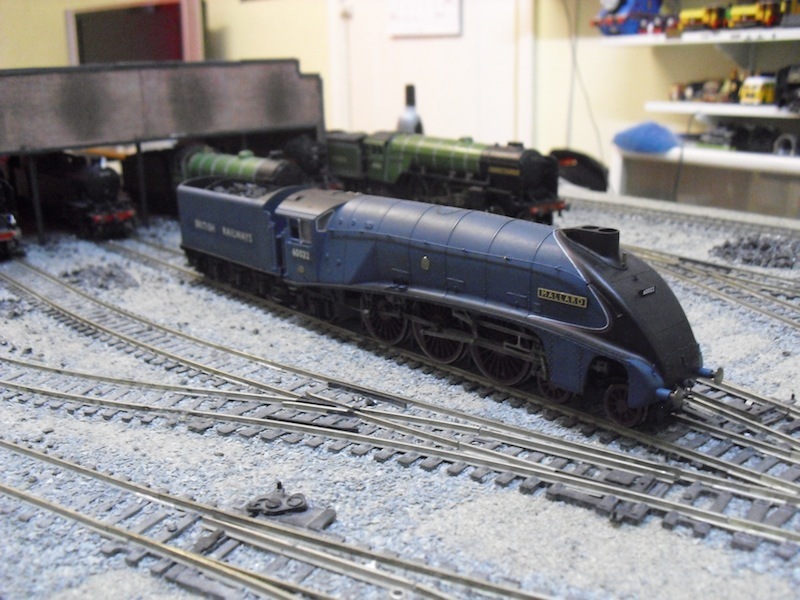 I cannot take any credit for the idea behind this conversion, as it is entirely derived from observations of a similar procedure made on the LNER forum, here. The valances were removed by scalpel, and then filed to their correct shape with a flat file, and then were carefully primed for paint with a wet'n'dry sanding pad. 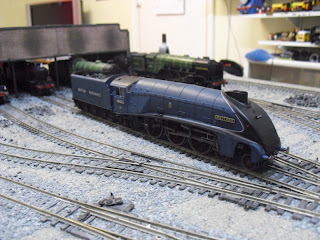 Of course, a devalanced Mallard model will be missing the bottom section of the firebox, which I created (as a temporary measure) out of plasticard. I am working on a latex mould currently, to recreate the bottom section in resin to add to the other A4s I plan on "defrocking" in the future. 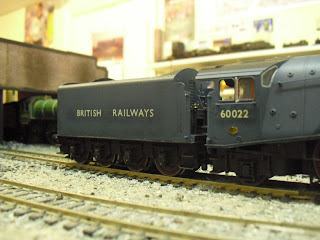 When the mould has cured and I've made a few resin copies, these plasticard constructs will be removed and replaced. ...because it only seems to be noticeable at certain angles or under certain lighting conditions. In real life, it's nowhere near as dark as it seems to show up on camera. C'est la vie, I tried something different and it didn't quite come off. The inside of the tender was given a bit of a wash with some PVA glue, and carefully selected and crushed lumps of real coal added. 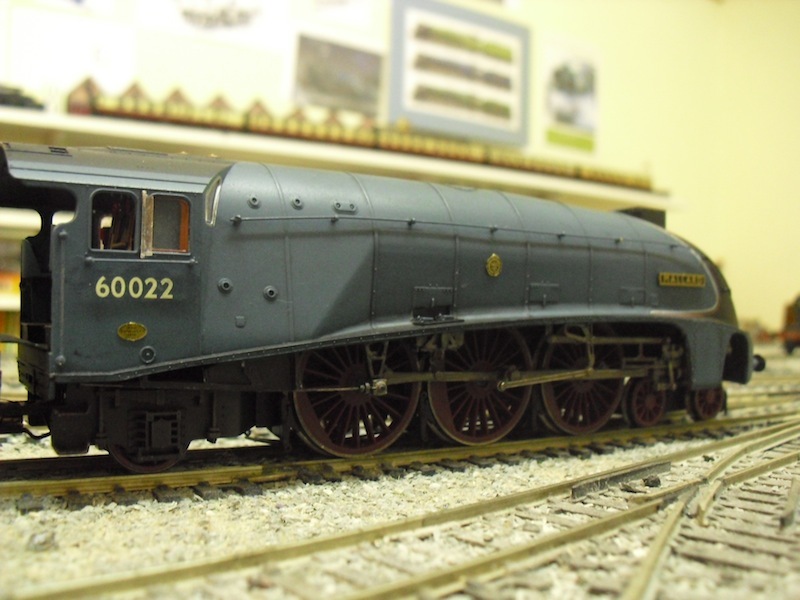 On the locomotive, I applied my usual brand of Fox Transfers decals to rebrand the locomotive, sealing them with a liberal coating of Gamesworkshops "Ardcoat" varnish. 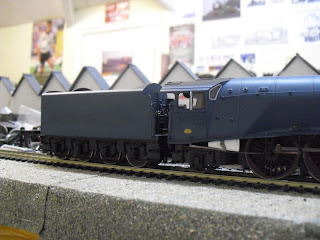 I went over the valve gear with a wash of Tamiya's "Oil Stain" colour from their weathering powder sets, and applied several different powders to the chassis (of tender and locomotive) including, but not limited to, "Gunmetal", "Oil Stain" and "Burnt Red" for a little rust relief. A few light coats of Gamesworkshops "Purity seal" sealed the powders and coal dust, and I added the Fox Transfers etched plates to finish the model off. Overall, I'm happy with the outcome. 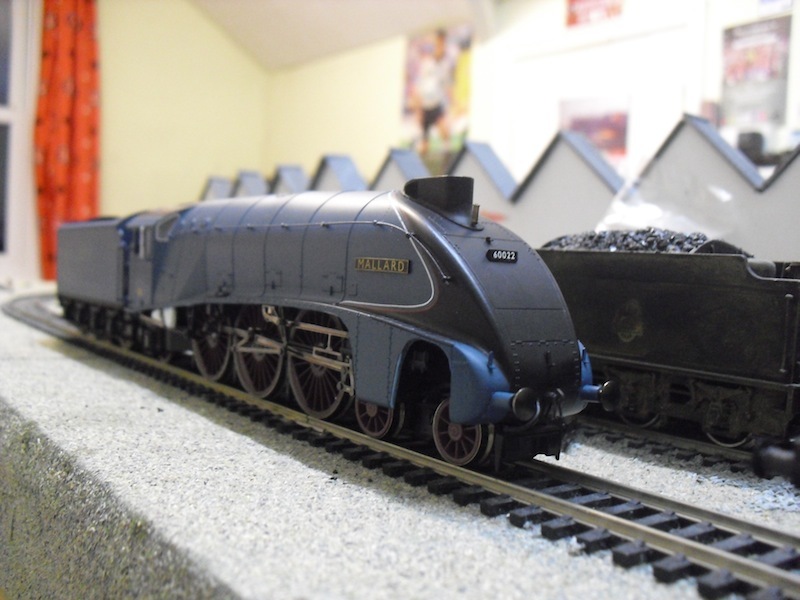 Hornby haven't as yet offered garter blue minue the valances in the top of the range A4 model, so this is a cheap and cheerful way of getting the combinations I want. 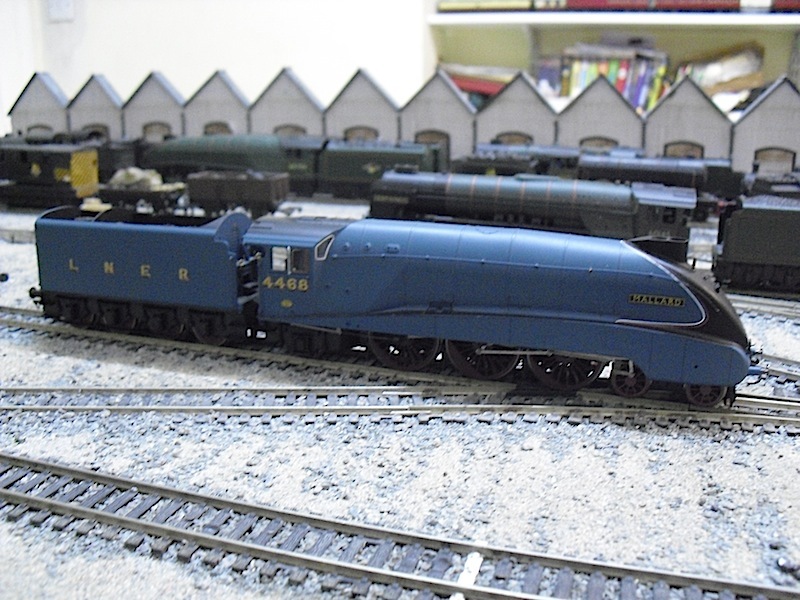 I am not certain I will be so confident after taking delivery of a couple of Hornby Great Snipes later in the year, at nearly four times the price of this second hand "spares or repairs" A4 model, but that's another story! I've certainly learned from this experience, and the next A4 I "defrock" will be finished even better, I would hope! Until next time, where I will hopefully be finishing 60503 between work shifts, and starting the next locoholism project in the form of another Thompson Pacific build.